Ms. Patel is a graduate of George Mason University and the Howard University School of Law. Upon graduation, Ms. Patel’s practice focused primarily on oil and gas litigation and white collar defense. In 2009, Ms. Patel followed her passion and started her own practice with a focus on juvenile and family law matters. She has dedicated her professional and personal time in working toward creating healthier children, youth, and families, and, in doing so, she frequently represents juveniles in delinquency and status matters in the roles of defense counsel and Guardian Ad Litem and, adults in criminal and child welfare matters. Ms. Patel is committed to the community in which she was raised, and was selected as a 2014 40 Under 40 Honoree by Leadership Arlington. 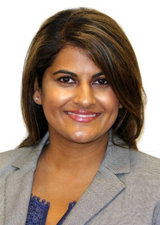 Since January 2015, Ms. Patel has served as the Chair of the Arlington Partnership for Children, Youth and Families, which is a community-led commission charged with researching the needs of children, youth and families, advocating for improved policies and programs, and engaging the community in solutions to improve the well-being of the community. Ms. Patel also serves on the Board of the Friends of Argus and Aurora House, which aims to financially support programs and services in Arlington County and the City of Falls Church that assist youth in becoming responsible, positive and productive members of their families, the community, and society. Since 2013, Ms. Patel has served as an adjunct professor at Howard University School of Law.